A RUP LIFE: Rachel Hauck Fires Up the Romance with “A Brush with Love” #Review & Kindle Giveaway! Rachel Hauck Fires Up the Romance with “A Brush with Love” #Review & Kindle Giveaway! Today, for review, I will be sharing a sweet novella by Rachel Hauck. In A Brush with Love we follow a sweet but hurting girl Ginger. She was in a terrible accident when she was a pre-teen and still carries the scars with her both literally and figuratively. Ginger needs to meet Jesus and see that He loves her, can heal her heart. When Tom her almost high school sweetheart comes back to town Ginger has to deal with the feelings that stirs up. Tom too has feelings to deal with and has to bring the past to light to help work through all of it. While this is a short read Hauck manages to tell us plenty about the characters in a way that makes the book flow. She packs a lot of story in this novella. I enjoyed seeing how each character finds a closer relationship with God and learns to trust his leading. 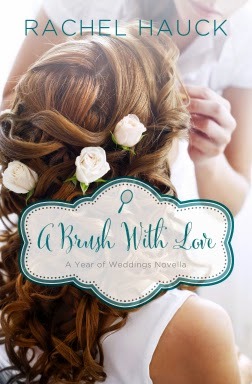 A Brush with Love | A Year of Weddings novella (Zondervan, January 2015) Ginger Winters is a gifted hairstylist with scars no one can see. The last thing she expects from the New Year is a new chance at love. Overcoming a childhood tragedy, Ginger emerges from the pain and trauma with a gift for bringing out the beauty in others. From the top big city salons to traveling the world as personal stylist to a country music sensation, success was almost enough to make Ginger forget her she would never be one of the beautiful people. Almost. Now that she’s back home in Rosebud, Alabama and running her own salon, the truth remains: Ginger is still that girl, forever on the outside looking in. But she needs her confidence this weekend. She’s the acclaimed “beauty-maker” for the Alabama society wedding of the decade. When high-school crush Tom Wells Jr. also returns to town and shows up at her shop looking for a haircut, Ginger’s thinly veiled insecurities threaten to keep her locked away from love, Despite Tom’s best efforts, Ginger can’t forget how he disappeared on her twelve years ago and broke her heart. Can she ever trust him again? When Tom challenges her to see her own beauty, Ginger must decide if she will remained chained to the past or move freely into a new, exciting future. Learn more and purchase a copy at Rachel's website.